Hawaiʻi Island police are asking for the public’s assistance with locating a Mountain View man who was reported missing. 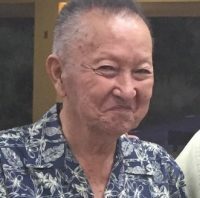 89-year-old Akio Yogi was last seen at 6 p.m., Monday evening, (June 18), in the 18-1400 block of Highway 11 in Mountain View. He has a medical condition that requires medication. Yogi is described as, 5-feet-5-inches, 130 pounds and was last seen wearing a fleece-lined denim jacket over a blue button-up aloha shirt, faded blue jeans, and “Crocs” for footwear. He may have been carrying a flashlight. Anyone who may have information of his whereabouts is asked to call the Police Department’s non-emergency line at (808) 935-3311 or Detective Jesse Kerr of the Area I Criminal Investigation Section at (808) 961-2379 or Jesse.Kerr@hawaiicounty.gov.